New Balance's marketing pitch: Born from Fresh Foam, fit to be fast. Upper: Multiple mesh types, synthetic nubuck. Full internal sleeve. Midsole: Compression molded EVA foam, 6mm drop. Outsole: Soft and grippy blown rubber. 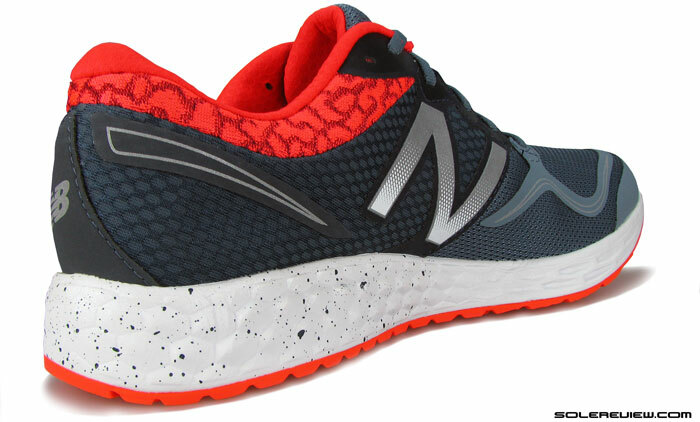 New Balance makes changes to its Fresh Foam formula, and uses it on the soft and smooth riding lightweight Zante. Fits like a glove too. Nice job, NB. The Fresh Foam comes of age. When the Fresh Foam 980 was introduced last Spring, New Balance called it the ‘science of soft’. As it turned out, their marketing team got a bit ahead of themselves. By around a year, give or take a few months. For the much softer Fresh Foam Zante is partly what the 980 should have been, and would have somewhat justified the hyperbole. And we use the word partly, because the Zante isn’t 980’s successor. There is another shoe in the works called the FF Boracay, which should replace the ageing 980 in Spring 2015. The Zante happens to be an extension of the Fresh Foam template, a brand new model which will attempt to make its own mark in the world of 6 mm droppers. The Zante also heralds the arrival of New Balance shoes which now actually come with a name, moving away from confusing numbered suffixes. To kick things off, initial names are island inspired – Zante is a Greek Island in the Ionian sea, and Fresh Foam Boracay borrows its name from an Island in Phillipines. It was quite easy to be fooled by last year’s 980. If you slipped on a pair and went for a run, the underside felt soft. It is only later you realized that the squish was coming from the memory foam like insole and not the novel looking midsole, which actually was quite firm. In our 980 review, we observed that a firm ride was not a bad thing, but ill conceived marketing certainly was. The new Zante, while not being 980’s replacement, makes amends for the latter. The adage once bitten, twice shy comes into force here, so it was natural for us to initially look at the Zante with an overtly cynical eye. But the Zante turned out to be entirely different, and we’re happy to report – mostly in a good way. There are some shoes which you know will dive headlong into a negative review, the list of lacunae filling the notebook at an alarming pace. Fortunately, Zante is not of that kind. Instead, it is a shoe which most should take an immediate liking to, and that impression should not change as you put more miles on them. Soft, responsive, light weight and well fitting, that’s the lowdown. New Balance makes much needed corrections to its Fresh Foam midsole formula, and the Zante is a manifestation of that update. 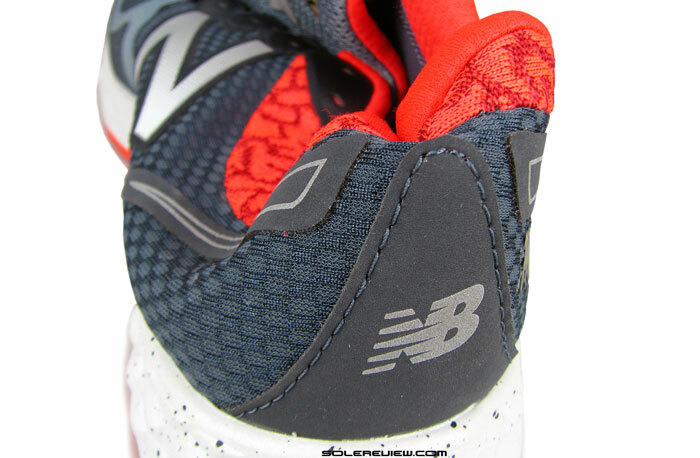 The midsole is now actually soft, unlike the firmer compound of the 980. It is also more responsive in behavior, as far as EVA foam based midsoles go. This also means there’s been a role reversal of sorts in the way the shoe is constructed. Instead of relying on a (FF 980) combination of soft insole and firm midsole, Zante goes the other way. 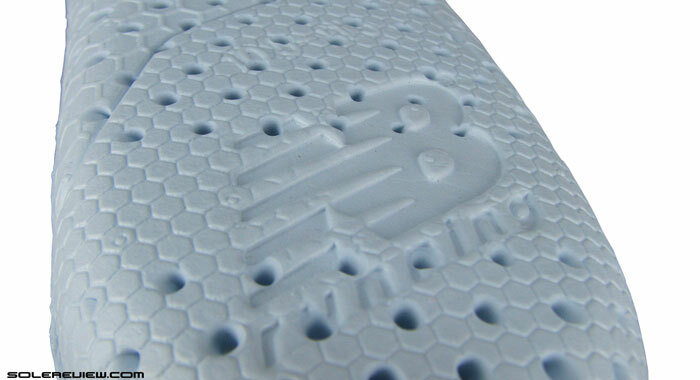 Insole is a relatively firm piece of perforated foam. 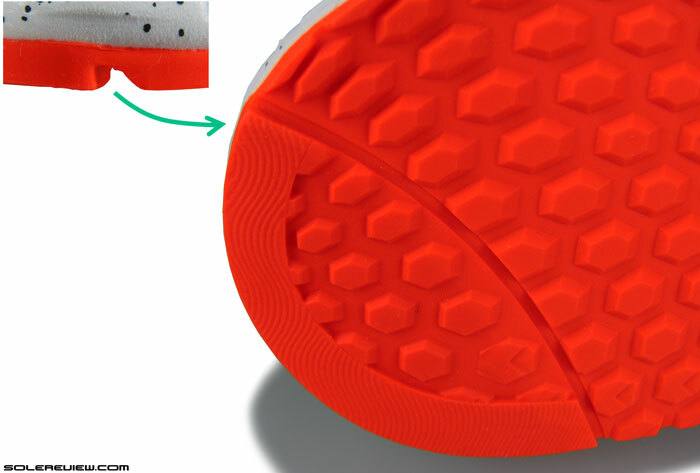 The molded insole has now been reduced to a thinner, perforated, less cushioned, compressed foam type. It rests atop a foam based strobel lining and a much softer midsole, which now takes on most of the cushioning chores. 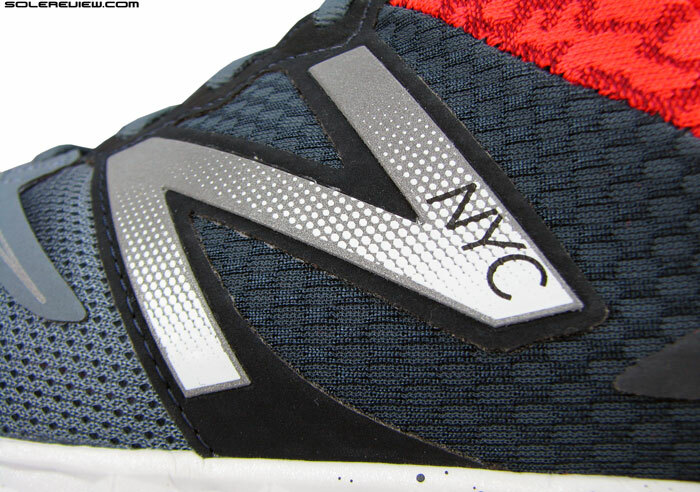 This shoe was the NYC edition, and we were lucky to buy a pair from NB’s website before it sold out. The brand says that regular colorways will release in March 2015. This was the NYC marathon colorway, so the shoe got areas of special treatments. 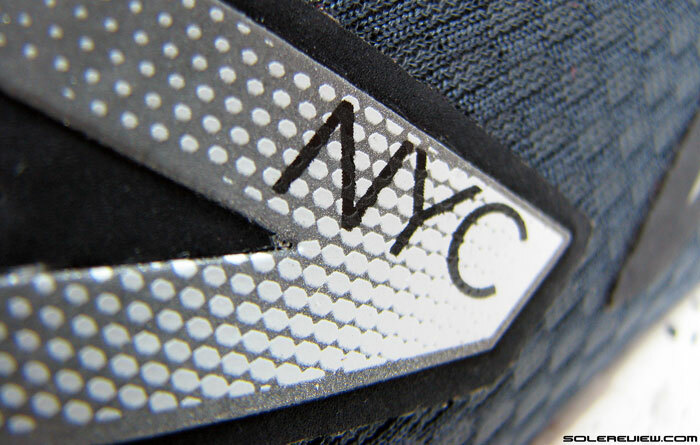 Both the insoles have the city skyline printed in black and white. The humongously reflective N logo gets a NYC callout. As part of this special colorway, the footbed top-cloth comes mono-chrome printed with the New York city skyline. 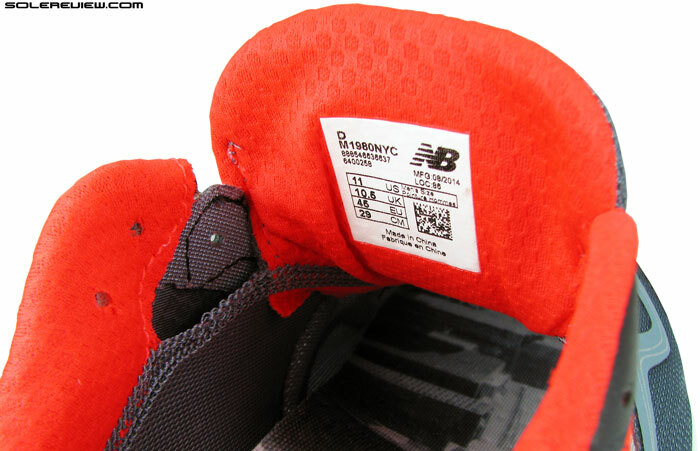 The right insole has just the skyline, while the left (pictured above) has ‘NYC’ sublimated in red over the heel portion. 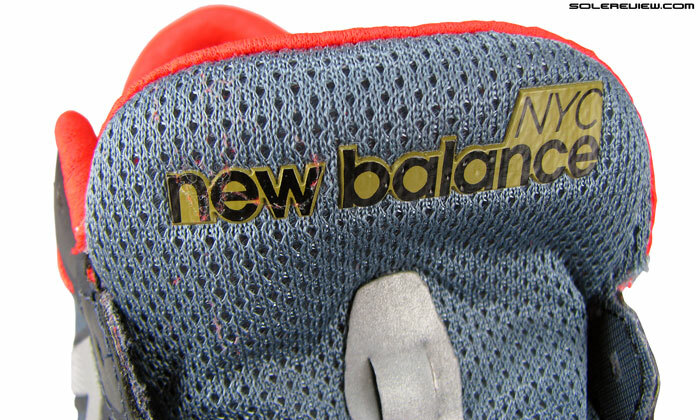 There are other areas which mark this edition, like the text over the reflective N logo, and the suffix on tongue top. Stitch free synthetic nubuck overlays on forefoot mesh – the fork on the tip is reflective, and so is the snaky print behind. Zante has a split eyestay, which makes the first row of lacing function with relative independence. Upper aesthetics bears slight resemblence to the 980. 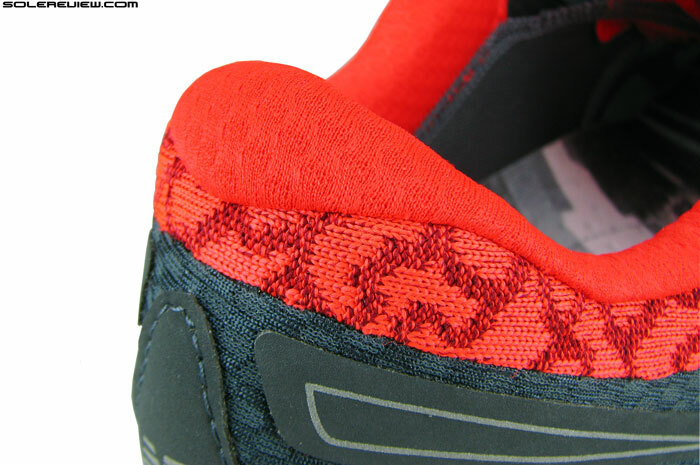 Stitch-free synthetic nubuck overlays snake their way over the lightweight forefoot mesh. But that’s where the likeness ends, as the mid and rear-foot areas take a different design route. 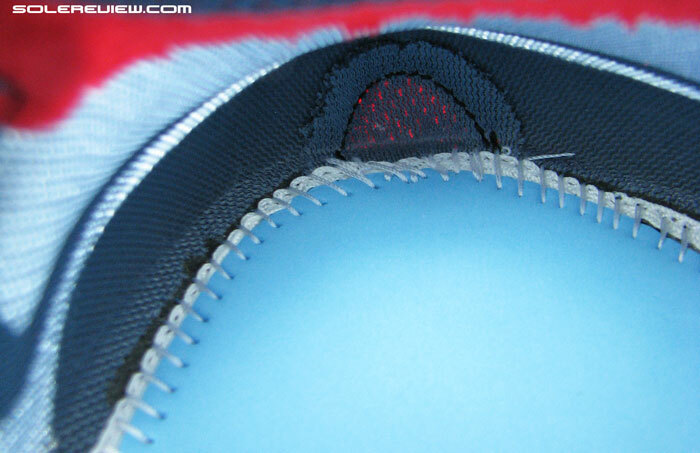 The lacing eye stay is not single piece, but is split into two areas. 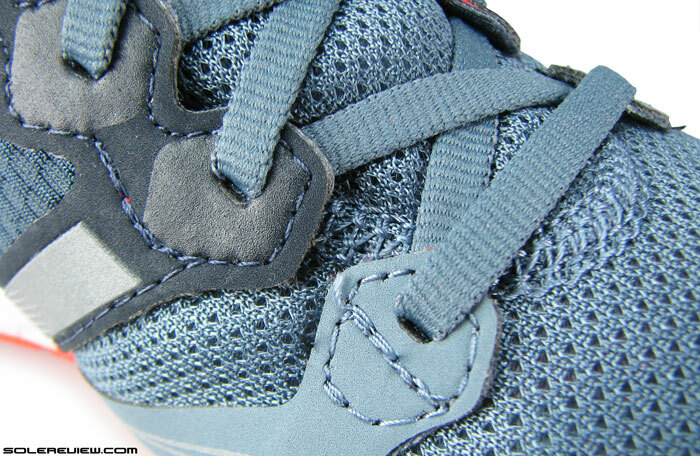 The first row of eyelets (forefoot) cinches independently as they are not part of the main midfoot panel. 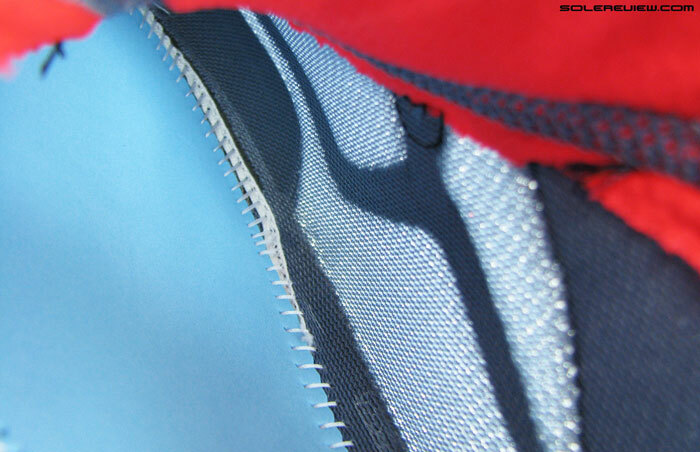 After the second eyelet, another type of mesh follows, with more synthetic leather overlays. Collar and tongue have soft linings, with outer section of the collar being textured fabric with a motif like design. All sleeved up, this shoe. No sliding business anymore. Sleeve extends till the heel area, joining the soft collar mesh. Tongue is flat-locked on the top instead of being attached on the sides. Makes the interior smoother. There are a couple of important things to be highlighted in the Zante’s upper construction. The shoe comes with a full internal sleeve which makes the upper sock-like. The sleeve is so long, it extends right till the heel, resulting in interior smoothness from the use of same material. The tongue is a component flat-lock stitched over the sleeve and not to its sides. So, as you can deduce, no tongue slide. This also happens to make the Zante suitable for barefoot use. There are no seams or bending components to cramp your run, and everything feels very comfortable over bare skin. Zante has a shallow collar, but still manages to grip rather competently. Achilles dip height is lower by around 6 mm, lateral collar wall by 4mm and medial side by a whopping 7mm. However, don’t let these numbers fool you into thinking that the collar doesn’t grip well. It actually provides a snappy fit over the Achilles without unwanted pressure or rub. That could be attributed to the Zante heel’s deconstructed set-up. Unlike the mega internal counter seen on 980 with its overbearing surround, Zante’s internal stiffener is very modest in structure. It doesn’t go all the way to the top, neither does it curve long around the sides. Just a rounded triangle of semi-stiffness doing its part to keep the heel in photogenic shape. Heel stiffener is compact. Does not go very high along the Achilles, which makes the fabric portion conforming. Collar walls are low, and so is the internal counter. It extends a small height from the midsole edge. At times, there’s only so much words can manage to describe, so we’ve tried our best to show what we mean through the series of photographs above. We’ve folded the upper over the inner heel counter so you can see its edges. The lack of heel stiffness allows the upper to better snap-fit on the foot, and if you needed more snugness, there’s that last row of eyelets. But wait, the tongue’s too short for that to work properly. If the circumstances demand the use of the last eyelet, laces would end up half on the tongue and half on the foot, which as you can imagine, isn’t very pleasant. Wish Zante had a slightly longer tongue. Like the 980’s length, for example. Midfoot fit is very snug, forefoot is just right. Zante has a narrow midsole waist, inspired by design elements from distance racers. We’re discussing fit, so let’s dive deep into that, starting with the midfoot. The Zante feels super snug in the middle, brought upon by a combination of three things, namely the internal sleeve, narrow midsole waist and finally the semi-independent midfoot panel lacing. The upper is form fitting in that area; it also wraps nicely under arch, although there’s not much under-arch support to speak of. You can go easy on midfoot lacing pressure in case you want your foot to have more breathing space. Forefoot fit feels great in standard ‘D’ width. At this point, information on additional widths is not available, but more details should emerge closer towards the general release month (March ’15). The existing width is snug but not constricting, staying away from creating any pressure hot-spots. The general lack of side overlays allows the mesh upper to take full control of fit duties, so the shoe feels nicely draped over the foot with some space left over for splay. The toe tip retains a shallow fit, as is the general upper trend in lightweight trainers. Toe bumper isn’t as pointed as 980, and creates room around the medial (inner) side of big toe. Winter might not exactly be the right time for these… very well ventilated. Toe bumper of the Zante has a squarish profile, which is a change from the pointy business end of 980. Runners who also own the OG fresh foam will notice that the Zante opens up some room on the medial (inner) side of the big toe. A good thing, that is. And the mesh is very breathable. We noticed that during our morning runs, when cool air breezed its way in from the forefoot. The shoe’s got a lunch buffet level of reflectivity. On the tongue loop too. And when the light shines bright at night, here’s how the shoe looks lit up. Simulated night time reflectivity: Lateral (outer) side. Simulated night time reflectivity: Medial (inner) side. Don’t know how the regular colorways are going to turn up, but New Balance surely went wholesale with low light visibility on this guy. Side logos shaped in ’N’ are fully functional reflective elements, and topped by ones on the tongue loop, heel and toe tip. The huge N is particularly conspicuous in the dark. 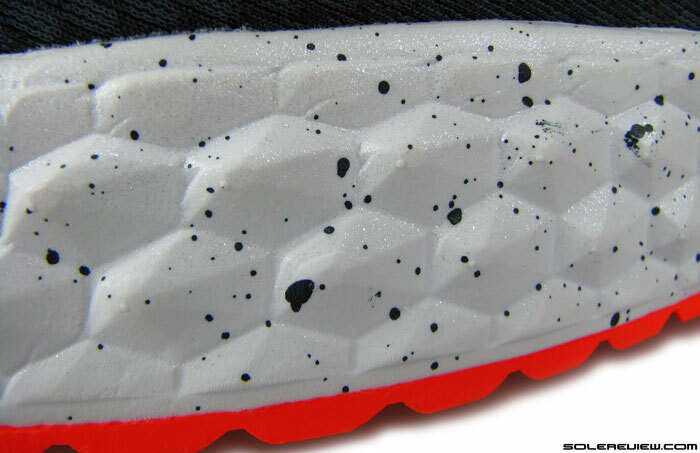 Carries over the Fresh Foam 980 sidewall design, but has some added speckles and glitter. Hexagonal depressions on lateral side allow more compression than medial side. Zante’s new midsole is singular piece of compression molding, and features the familiar, honeycomb shaped design on its walls. Except that our color came with glossy finish (reminiscent of Brooks Transcend) and speckles. The minimal upper and lightweight midsole makes for a very lightweight shoe; 235 grams / 8.4 Oz for a half pair. That’s around 10 gms lighter than the Saucony Kinvara 5. Ride is much improved over the original Fresh Foam midsole. The slim, low profile midsole doesn’t have much foam volume, so there’s no sink-in feeling, only noticeable softness. 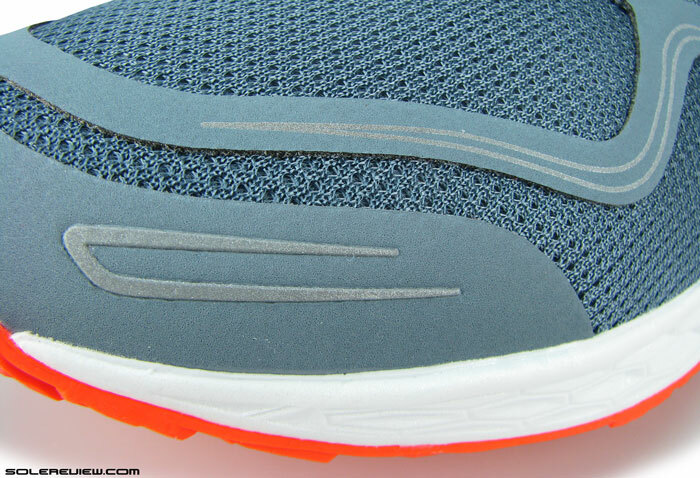 Most of the cushioning comes from the new midsole and outsole, with insole and strobel only playing a minor role. Footstrikes are adequately soft and responsive, and transitions are very smooth. This occurs both due to the single foam midsole design, and the full contact outsole which has many small, hexagonal nobs hugging the bottom. Since the foam is soft compound, it also helps flexibility in the forefoot. You’ll also see compression creases on the sidewalls after a few runs. Nothing to worry about, that is normal for this type of a midsole. The entire outsole is made of soft, blown rubber. Has great traction. 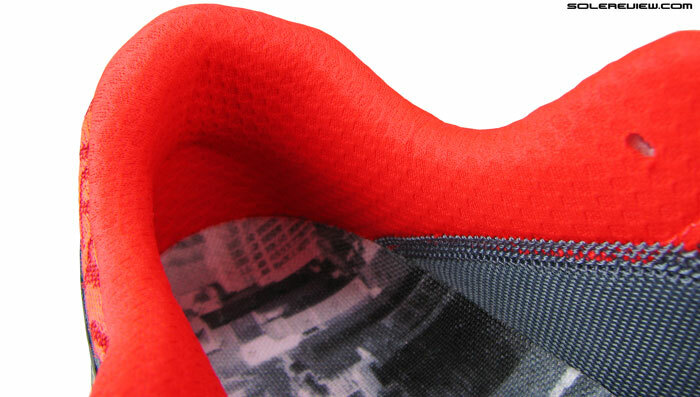 Crash pad is separated by a flex groove, but is part of the single piece outsole. We point this out because the 980 had a separate component. 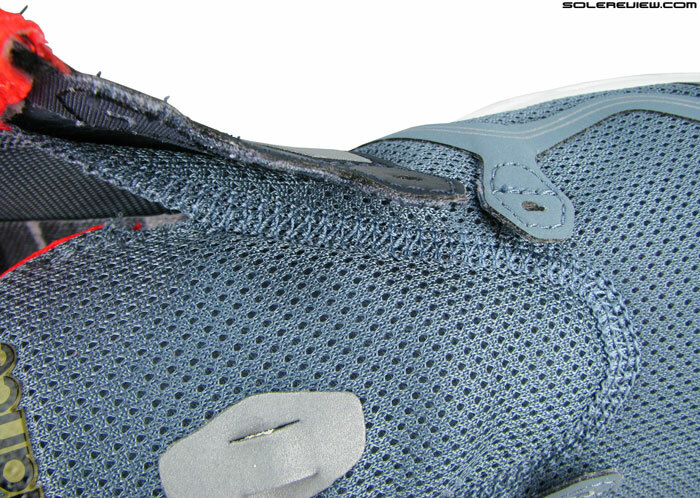 The outsole design language is nearly identical to the 980 except for two areas of differences. The crash pad isn’t a separate piece like it was in the 980; instead it is now part of the rubber sheet, but visually separated by a flex groove. 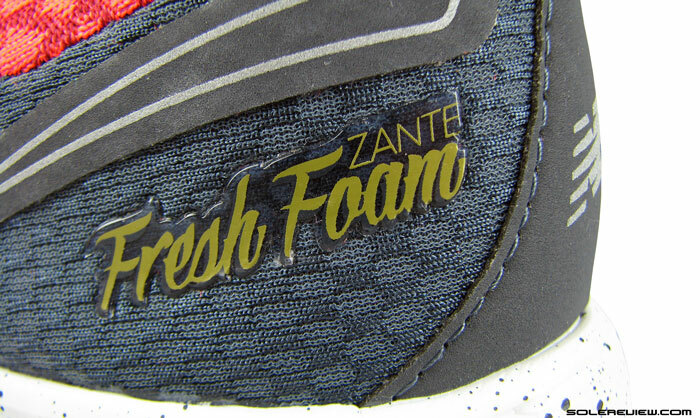 The Zante’s outsole also happens to be more softer than that of 980, and this does two things. Improved grip, which happens to be great on the Zante, and it also increases cushioning feel as the rubber density gets closer to that of the midsole. A few runs in the Zante reminded us of another shoe which feels somewhat similar – the 4mm drop Nike Lunarlaunch. Similar weight and upper feel, except that the Nike felt more cushioned and with a harder outsole. What? Do you want to know whether the Zante has any faults? There isn’t much to talk about. Please? Ok, if you want us to nitpick, here’s a couple. The laces are too long, which means that the aglets (yes, that’s what the lace tips are called) slap around during runs. They also tend to get crushed under the foot every now and then. So one needs to tie big loops so that there’s less free length remaining. The other area is outsole durability. It is a single sheet of soft, blown rubber which adds to the cushioned ride and superlative traction. But soft means more wear, and Zante does not escape that generalization. You’ll start seeing quick wear on landing areas. The durability level is similar to what you might see on many Brooks shoes. But other than these small non-concerns, the Zante performs great, and is a redemption of sorts for New Balance’s original non-delivered cushioning promise. It is a lightweight shoe with extremely neutral road manners, and would serve well as a daily training shoe. Maybe not a full blown race shoe, since we would have liked something firmer, but that’s just us. Regardless of whatever use you find fit for the Zante – be it daily training on roads or track, or running races, it is a good shoe to have in your rotation. With the Zante experience behind us, the upcoming Fresh Foam Boracay has really piqued our curiosity. I’ll definitely have to try these out! Thanks again for the awesome reviews! Hi! Thank you for the kind words! The Pegasus 31’s are more cushioned – both in the heel and forefoot. Actually the Zante doesn’t have much foam volume, so there’s a hard limit on the cushioning. However, we find the Zante to transition better (heel to toe), and grip better. If you’re forefoot striker, then the Pegasus will feel more padded upfront. Thanks for this review, I’d be interested to see how this revised last with the FF ‘named’ series translates to their trail offerings. The V1 FF trail and MT110 V2 have been pretty poor offerings by all accounts! Our sense is that NB won’t make changes abrupty, but spread it over time. Because runners have really gotten used to New Balance numbers, so wouldn’t be a good idea to yank it out all of a sudden. Thank you for the great review, as always! How do they compare to the Bostons 5, concerning cushioning and fit? Did you measure stack height? Compared to the Boston, forefoot fit is more relaxed, and cushioning is softer. We don’t measure stack heights, as it is difficult to do so accurately without the right tools. We quote manufacturer specs on stack heights and heel drops wherever used. I asked about the stack height because from the photos, the midsole looks a bit thick. Anyway, I think it will be a nice complement to my 1400 as a longer distance shoe. You’re welcome. Stack heights should be published by NB sometime in February or so! Hi Nikos, stack height in the heel is approx. 15mm and the forefoot is approx. 9mm. We’ve put more miles on the Zante since, and our impression hasn’t changed. just tried these and personally I prefer the original 980 in terms of ride, though both have the issue with the medial big toe room for me – however the upper is a softer material so it is less apparent I think. The laces are on the short side on mine too. Thanks for the great review and your hard work. Thanks for the picture and feedback! I’m a bigger guy, 2m tall and 85kg, who has run exclusively in Kinvaras for the last couple of years. I’m thinking of building a bit of a rotation because I’ve been told that it can reduce injury. I’m not a chronically injured runner, but I’m also not as young as I used to be so it’s more of a precaution. I’ll probably get a pair of Saucony A6 for intervals/repeats, would you recommend the Zante as a higher mileage/recovery shoe, or is it too similar to a Kinvara? Compared to the Kinvara, the Zante runs much softer and responsive in cushioning. It will serve well for high mileage and recovery runs, and is sufficiently differentiated to deserve a place in your rotation. I’m training for a marathon and I’m looking for some high mileage trainers. I’ve been looking at this one and also for example the Adidas Glide 7 Boost – how do you think they compare? If you were to recommend a third option what would that be? I’m 1.82 and 73kg and usually wear low drop shoes, between 4-6mm and with an average about of cushion and a mid foot striker. Zante is lighter and softer riding than the Glide 7. But GB Boost 7 isn’t a low drop model, it is at least 10mm, if not more. The third option would be the Skechers GoRun 4 – the outsole isn’t as durable as the other two, but great transition, roomy fit, and a midsole design which works for late stage rearfoot and early stage forefoot strikers. Out of interest, I tried on a pair of the new Boracay side by side with the Zante today. They are completely different in many ways: the Boracay has a much straighter last, a wider sole at the arch, a slightly different direction to the small lugs on the tread, a thicker upper and heel cushioning and feels a little bit fuller all round. It was hard to determine if there was a weight difference but it did seem slightly heavier. The size 10 had lots of volume in the toe box and seemed to require more synching and gathering of the lacing channel. The laces are super long too. Overall, they didn’t seem to be right for me as a high mileage runner with straight narrow feet. I didn’t buy either in the end and left the NB store disappointed as on paper I was keen to get the new Boracay. Back to my tried and proven Asics. Not surprised by your feedback. While we haven’t had a go in the Boracays, it should feel different (from Zante) as it succeeds the original Fresh Foam 980. And what about the Zante, how did you find them? runs and races? Or do you recommend another shoe for my running style? What shoes have worn (and liked) in the past? That would provide a good frame of reference. Brooks ghost 7. I have only just started running 4 months ago. 3-4 runs per week (3 longer runs and 1 tempo/interval run). I would like a lighter shoe for the tempo runs and rond races. so I’m afraid I don’t have any reference. I just want to be sure I’m getting a shoe without stability features. I was wrongfully put in kayano 21 before video analysis showed I’m a supinator instead of an overpronator. Up until now I have used the asics super j33 for speed work but this is also more suited for overpronation. I have some shoes in mind for the speedwork: Saucony type a6, mizuno hitogami 2, adios boost 2.0, Zante, nike free flyknit 4.0, NB 1400V2. The Fresh Foam Zante is a shoe without any stability features, so definitely an option. Among others, consider the adios and Boston Boost, Nike Lunarlaunch and Brooks Pureconnect 4. We’ll have an opinion on the HG 2 and NB 1500 v1 (not 1400, though) later this month when we post their reviews. For sheer speedwork, adios/Boston seem the best fit for your needs. But they run firmer and snugger than shoes like the Zante and Lunarlaunch. thanks for the helpful input. I went with the adios boost 2.0. I think this will be the perfect combination as a speedwork training/ race day shoe. Even for the longer distances. You’re welcome. Look forward to your usage feedback after sometime under the adios Boost review page, will help us and others! 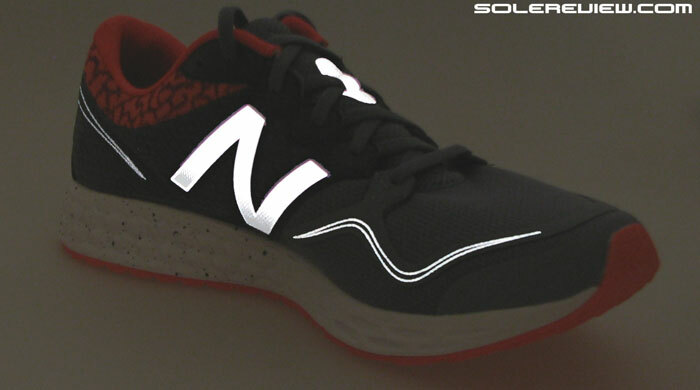 I’ve been running with NB 890 v4 for several months as daily trainers, they are almost over now and was thinking trying the new Zante. Which are the main differences between the two shoes? I really love the 890 for long and tempo runs, not so for races, where I use the Adidas Boston 5 (marathon and HM) as they are more reactive and with a faster transition. FYI I’m quite slim (1.80 for 68 Kg) and my slow training paces are around 4.45’/km. Thanks and congratulations for the comprehensive reviews and the really nice, well detailed and defined pictures! Hi, we haven’t tested the 890 V4, so can’t help, sorry! 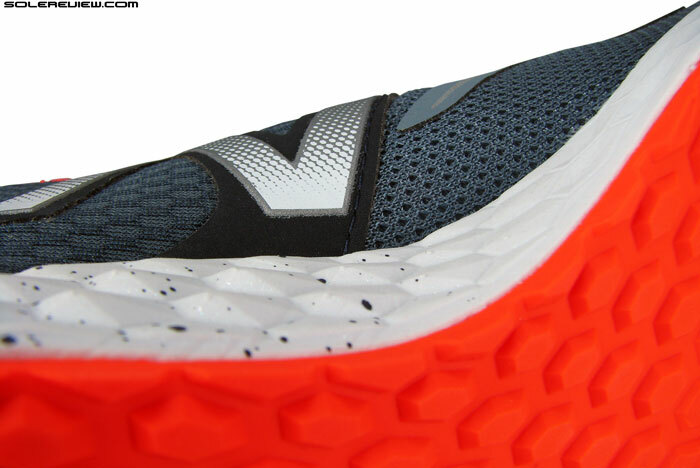 We will however, review the 890 V5 in a month’s time or so. But the Zante is adequately differentiated from the Boston by being more cushy and accomodating in the upper, so nevertheless a good shoe to have in your rotation. The NB 890V4 have been my favorite daily trainers…until I ran in my Zantes. The Zantes imo, are much more responsive (especially at faster paces) and have an easier transition from strike to toe off. As far as differences, the Zante’s have a lower drop at 6.8 (compared to the 9.6 of the 890V4) and have a better ground feel but feel less cushioned than the 890’s. Overall, I love both shoes but find myself wanting to run in my Zante’s more than their fair share of runs. I think it will be a great shoe to add to your rotation! same here! I had been running in my 890v4 and when I bought my Zante, I totally loved it! I run mainly on my Zante now and will still use the 890v4 on and off. I recently got myself a 2nd pair of Zante! Hi, great review! Would you recommend this shoe as an alternative to the Hoka Clifton – I absolutely love the feel of the Clifton, the cushioning is spot on and the transition is smooth (where as the Saucony Ride 7 just feels firm and inflexible to me), however the toe box is an issue for me with the Clifton – just too small and 18mile+ runs big toes hurt?!?! We’d wait up for the Fresh Foam Boracay due to release in the next week or so. That’s the replacement for last year’s 980 and said to have revised midsole formulation. The Zante is (supposedly) a lower profile version of the upcoming Boracay. Maybe try going one half size up and see if toe pain disappears. Just tried on a pair of the Clifton’s this morning hoping for good things but also ran into the small toe box immediately 🙁 So sad. Just tried the recently released (regular version) Zante in Green/Black. The upper does not feel as stretchy and form fitting as the Grey/Orange (NYC limited version). The laces are definitely different as these Green/Black do not stretch. The midsole and outsole feels the same on the treadmill as far as I could tell. The Green/Black retains only the forefoot forked reflective strip unfortunately. Just wanted to thank you for this review, that made me buy this amazing shoe. Finally a shoe that can compete with my long distance racing shoe for the last 3 years, the Nike Lunaracer+ 3 and even be used as a daily trainer as well. A very, very versatile running shoe. Perfect drop (6mm), light, great mid- and forefoot fit and I love that snappy but still cushioned sole. Too many shoes today have pretty “dead” EVA soles combined with (too) soft insoles. 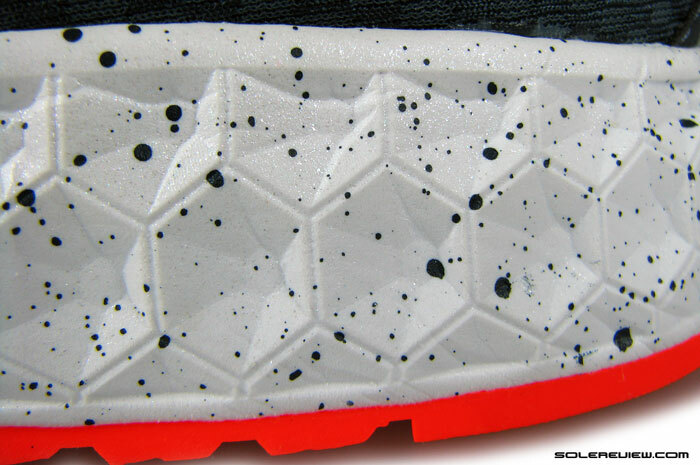 Only the Boost, Lunarlon and now Fresh Foam really offer great energy return (imo). Minor complaints…long shoelaces, lose heel cup and maybe a bit too flexible for long distance races. But thats a matter of opinion I guess. Thank you for the comment and feedback! Happy to hear that our review helped with your purchase decision – the Zante is a great shoe. The forefoot flex is subjective, though a majority prefer a firm front for better touch and go. Congratulations for the in depth analysis. Unfortunately rare. have a pair of NB Leadville 1210 and love the resisting Vibram outsole. Now I bought a pair of NB M 980 V4 for the long runs on concrete roads +25km. I can’t use them though as my big toe has no space. I’m hesitating between the more recent NB’s Fresh Foam like Zante or Boracay or eventually a pair of Kinvara 5M? My intention is to find some forefoot cushioning and enough toebox for Mid- / Forefoot landing. We’re yet to review the 890, Innov-8 and Leadville so don’t have any insights on those models. But between the Boracay, Kinvara 5 and Zante, the Boracay has the roomiest forefoot in standard D width. Loosening up the front lacing rows also creates some more splay room. Full ground contact outsole, so the Boracay performs the best on footstrike out of these three models. More cushioning on the Boracay too. And we love black Belgian chocolates, thank you! I have found the ride of the Zante to be similar to the Pegasus 31 and that is not favorable for me. The step-in feel is nice and the shoe is extremely comfortable to walk around in. However, I am a supinator or underpronator and I have problems with midsole designs that feel like they’re pushing my foot laterally when I strike. That’s what the Zante midsole feels like to me. Like it is pushing my foot out. I know I am in the minority but that’s what it feels like to me. Thanks for the feedback – have you tried the Boracay? i know this is the zante review but i wanted to know how’d you compare it to boracay? i wanna buy my first NB and i want it to be a soft one because the last shoe i’ve bought is too firm for me for longer runs (ride 7). and i’m planning to use it for ultra if boracay is what nb claimed to be as soft as the sands of the island boracay. 😉 btw, my first running shoes was the pegasus 30 and i loved it. the only prob is i bought the wrong size (black toe nails) . next one, altra olympus (needed something for ultra trail running. good also for roads but dayum the outsole wears out so fast on concretes) then the saucony ride 7 (only ideal for half marathon for me. my inner ankles feels a lil soreness if i use them on long periods but fortunately, the soreness goes away when i switch to my olympus). i think the NB boracay can be good for ultra coz tony krupicka was wearin a freshfoam on his last UTMB.. now the question is, is it soft enough to be softer than the ride 7? Hi, our Boracay review is a good place to start, it has a lot of detail on how the shoe feels. It is not super soft, but we feel it runs softer than Ride 7.
well, i’ve read your boracay review a few days ago so i went on and got mine! it’s the softness that im looking for. ride 7 really is too firm for me for long distance runs. i’ll just save it for shorter runs or some tempos. the boracay will be for my longer ones and probably my raceday shoe as well 😉 your reviews are really accurate. thanks! keep up the good work. Currently running in the Kinvara 5, Flyknit 4.0, and Pegasus 30 for easy recovery runs. How would you describe the cushioning of the Zante vs the Kinvara 5 which shoe is more cushioned vs responsive in the midfoot forefoot. I am also on the fence about the new Nike Lunar Tempo, seems like a good contender against the Kinvara 5, do you have any input about the Lunar Tempo cushioning? the Kinvara is more cushioned than the Zante. While the heel stack heights are similar, the Saucony K5/6 has a separate Powergrid foam insert which increases cushioning. Same goes for the forefoot too. On the other hand, the Zante feels more responsive than the Kinvara, owing to its single density (and a different quality of) foam midsole. The transitions also feel better on the Zante because of its smooth outsole. The LunarTempo cushioning feels somewhere between a Zante and Kinvara. And the toe box is super shallow, so your big toe tends to press out on the mesh. Will you do a review on the LunarTempo? I’ve been looking for a shoe to replace my 1st gen Adios Boost, which I’m very happy with except for the not so durable outsole. I’ve bought both the Energy Boost 2 and the Glide Boost 7, but they both cause me ankle pain after a run between 7 to 10km (but not during a run though). It seems my ankles need flat running shoes like the Adios Boost. Given the low heel drop of 6mm, do you think the Zante would be a good fit for me? I really want some cheaper alternatives to the expensive Adios Boost for training runs. Have you tried the Boston Boost? 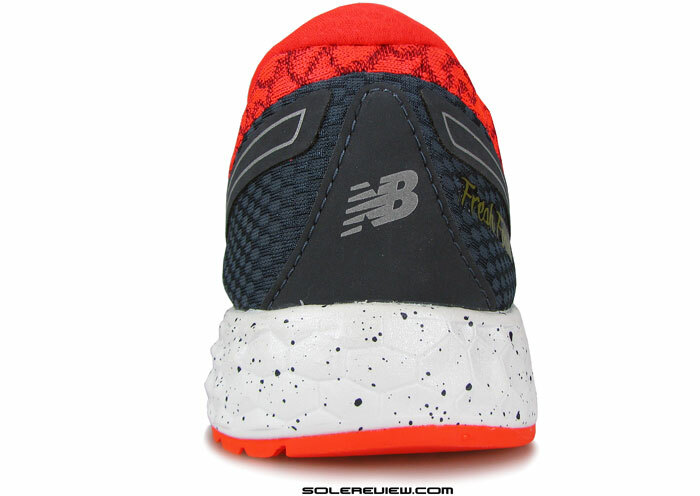 Also, would think the NB 1500 V1 to be a better option than Zante, when compared to the adios Boost. The Zante is good, but it is not as stable in the heel as the adios. Try all three shoes at your local store if possible, and see which one feels best and similar to the Adios. No I haven’t tried the Boston Boost. Unfortunately, there isn’t a local store that stock all three models. For the Boston Boost, it’s only available at the local Adidas store. It’s even worse for the NB 1500 v1, it’s only available at the NB online store for now. I’ve tried the Zante at a local sports store and it felt nice. But until I actually run in a pair, I simply can’t tell if it would cause me ankle pain. Since the Zante is the cheapest of the 3, I might just take the plunge. The Zante is otherwise great so should work out ok for you. Let us know how it goes! I’m a fairly new runner, but I’m aiming to run a half marathon. I usually run with my Nike Free 4.0 shoes, though recently they’ve been cutting into the ball of my foot. Which shoes would you recommend between the Zante and Boracay for a beginning runner who wants to work up to some serious miles? Thanks in advance! Actually both are nice shoes, but the Zante will closer to home, considering you’re switching from a Free 4.0. Hi, I am searching for a ligth shoe with an excellent traction on compacted dirt roads (but not a trail shoe). I have read some review and it seems not to be its best feature. What is your opinion? Thanks a lot! Out of the shoes we’ve tested for solereview, the Brooks PureConnect 4 and New Balance 1500 V1 are noteworthy mentions. If your toe is making contact with the front overlay, then would suggest a 9.5 – since you already have room for toe splay, and makes a 2E not so useful. I am between the Zante and the 1500v1, I regularly make my trainings using ON Cloudrunners (heavy shoe). And I am looking to have another pair to run 5k,10k up to 21k. I use to have plantar fascitis in the past so what would be your recomendation? What are the pros and cons of this shoes? Can the 1500v1 be considered as road/trail shoe? Between the Zante and 1500 v1, we’d pick the latter. It has a more supportive midfoot and heel section which works better for PF, and the multi-piece outsole will perform better on light (unpaved flats, wood chip/bark, fine gravel) trails. Haven’t tested the Cloudracer, so can’t offer an opinion on how it compares with either the Zante or 1500. Needing a new light trainer that won’t kill my wallet so I’m in between a few different shoes and noticed the Zante. It seemed to fit the bill but I’ve been told it’s more of a racing flat. Considering I usually train in Saucony Kinvara 5 would this be a good switch or should I look for something with a little more beef? And does the boracay have more midsole compared to the Zante? I looked at a few measurements and despite the bigger look and added weight it said the boracay actually have a lower stack height that the Zante. The Boracay has more midsole foam than the Zante. Stack heights tell only part of the story; what matters more is the actual volume of the foam. In this case, the Boracay has a wider (sideways) base compared to the Zante, and hence more foam. If you have been running in the Kinvara, the Zante will feel pared down. You can try the Hoka Huaka or the Fresh Foam Boracay. Would you reccommend this shoe for a forefoot striker? Thanks. Yes. Also, please read the comment at the link below with feedback to your posting behavior. Thanks. I run sub 20-minute 5Ks and am looking for a new shoe to replace my pair of Nike Free 3.0 v5s. Would you recommend the Zante or the new Nike Free 4.0s? Thanks. Both shoes are good, except that the Zante is softer. If you’re coming off a 3.0 V5, then we’d recommend the Free 4.0. And you’re talking about the non-Flyknit Free 4.0, right? There are two versions which exist currently – one is with a Flyknit upper and the other without. No idea at all, haven’t put miles on the Vazee Pace yet. We’d put our money on the 1500 V1. 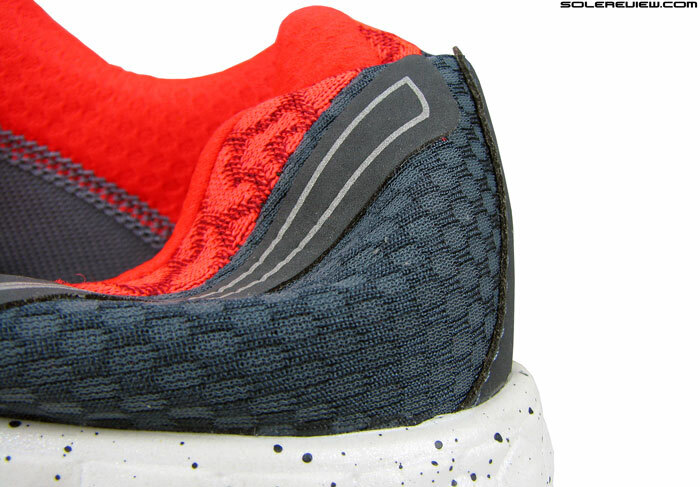 The outsole has that semi-trail kind of texture, and the feel (ride) is very focused without sacrificing cushioning. About a month ago I got a chance to do the shoe trail with a local running company. Wore the NB Zante out for a speed workout (hill repeats) in the park on dry asphalt. Everything felt good about the shoe, the forefoot width, overall weight, ventilation, grip, lacing pressure, heel lock down. The only thing I noticed was the insole keep moving backwards (I can feel the insole tip under my toes) inside the right-foot shoe. I had to stop a few times during the workout to remove the shoe and re-seat the insole. Even after re-seating the insole, it keeps sliding back. Did any of you experience this? or I just got a fluke? Not sure about our readers, but we did not experience this! I’ve had the same problem with multiple pairs of Zantes. I think it’s especially pronounced for forefoot strikers, which I am, since there’s a tendency to “claw” with the toes. I thought about trying to glue them in place, but the loose insoles combined with terrible durability have taken off me off the Zante, even though out of the box, I think it’s the best shoe I’ve ever worn. Too bad. We haven’t tried the 1400 V3 yet, so can’t say how they compare vs the Zante and LR3. The Zante feels softer than the LR, but the Nike is more supportive. Hi! Thanks for the great review. It’s been very helpful. I’m currently looking for a new pair of running shoes to replace my beloved Nike Free 5.0. Zante really caught my attention by how many good reviews it garnered. However, I have second thoughts because I’ve read somewhere that Zante’s ride feels like of Kinvara’s. I’m not really comfortable with Kinvara and I usually get shin splints from it. So should I buy this shoe? Or is there a better shoe that’s closer to Nike Free’s ride? Thank you so much! Any specific reason why you want to replace the Free 5.0 if they’re working for you? The new 2015 Free is an improvement over the 2014 model, so worth an upgrade. The Zante rides differently from the Kinvara. In the sense that there’s more ground feedback in forefoot and heel, and it feels more cushioned/flexible. The Nike Free has a unique ride, so if you’re up for the 5.0, then try the Nike Free 4.0, non-Flyknit version. And if you don’t want to try the Free at all, then try the Nike LunarLaunch, or the Skechers GoRun Ride 4. Firstly, easily the best running shoe resource on the web, can’t believe I’ve never been here before. I run in nike 3.0 flyknits and love them but need some shoes with similar pace but more durable for lateral movement required for Australia football preseasons. The flyknits tend to give way laterally and wear out from kicking. Is the Zante more durable or can you suggest a shoe for speed and lateral movement? Thanks! Only the NB 1500 V1 comes to mind. Wanted to ask – what has your experience been with football shoes with TF (turf) soles? Those go pretty fast, and will provide a lot of ball feel and control while being durable. Unless you’ve already tried them and find them wanting in a few departments. Non-gum rubber (basic rubber, not the brown soled ones) IC indoor court football shoes will also do, unless you’re training on grass. Running shoes are inherently unsuitable for lateral movements, because they are designed for use in a linear path. I’ve never seen anyone wear turf sole shoes. I can imagine they would be sturdier and provide grip but not sure if they would be suited to the significant amounts of running done over the course of a session. The cricket clubs that own the ovals are also quite strict about their grass being overly disturbed. There isn’t really a perfect show, unfortunately. But thanks for the tip, hopefully pick up a pair of 1500s soon. Actually Turf shoes have evolved in the past few years, becoming more comfortable – definitely more so than hard plated cleats. And the Cricket clubs needn’t worry; TF soles have very mild nubs, no better or worse than running shoes. But funny they bring that up, because most of Cricket footwear have cleats. Fast bowling and batting footwear have aggressive metal cleats with 4-6mm length, regardless of them being restricted to the pitch area. Really appreciate your reviews, they are great! I am currently training for a 1/2 marathon in Kinvara 5’s, which I really like, but was looking for a similar shoe with a little more cushion as a 2nd shoe to train in and potentially race in. I was between the Boracay and Zante and went with the Boracay based on the slightly lower drop and store recommendation of Zante being more of a speed trainer. Still torn between the two as I like the lighter weight of the Zante. Since I am looking for something similar to Kinvara’s with a little more forefoot cushion, would you recommend Zante, Boracay or even something else for a 1/2? Thanks in advance. Alongside the Boracay (over Zante), we’ll suggest two other shoes. The first is the 2014 Hoka Clifton – extremely well cushioned, low drop, and same weight as the Kinvara 5. The second shoe is the Nike LunarTempo. Super lightweight, and goes quick with adequate cushioning for a half. Its static heel drop is high, but don’t worry about it unless you have strong personal reasons of your own (for preferring a low drop). Really great review as always! 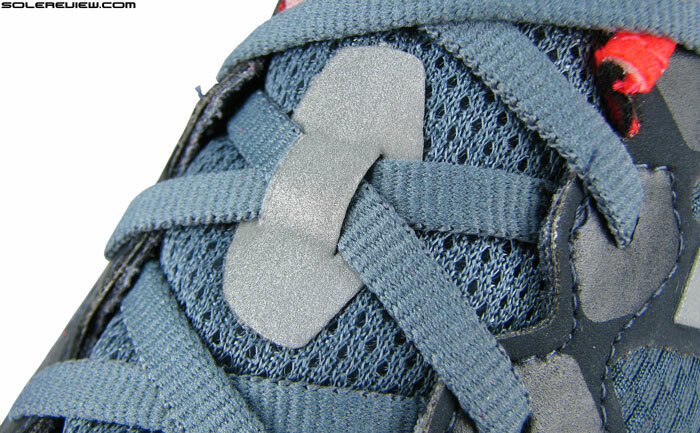 Jack, the Zante does not have lower upper reinforcement, so you might want to consider something like the NB 1500 V1. And 55 miles a week is very decent mileage, so does this mean you have 600+ miles on your Boracay? Thanks, I’ll have a look at them! I’d reckon 600 miles is about right, but I noticed the tears at the end of November and they looked like they’d been there a while, hence my surprise. The other day I realised the insole on the right shoe has a mysterious chunk missing, so it might just be me! Haha true! 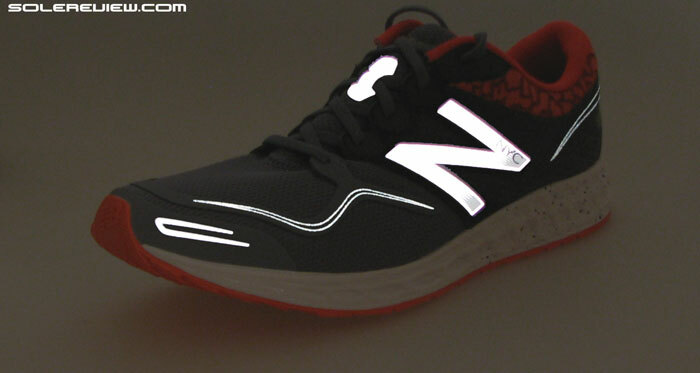 I see that the NB 1500 is more a racer type shoe. I’m looking for something that can handle long runs and jogs. Would the 1500 be suitable or would something like the Kinvara 6 be better? Thanks again! Look no further than the Nike Free RN Distance. Have you run in the Free RN Distance? How does it compare to the Lunartempo? Different in many ways, so can you be specific? The RN Distance is very interesting to me. Kind of reminds me of a Pureflow type shoe. I love the 4mm drop and, what seems like, ample cushion for longer distances. I never even thought about them! Thanks for the advice! Hi, I´m not a professional runner but i run about 18 miles per week and i wanted to know which shoe you recommend me. Usually i run on the treadmill, street and sometimes trail running too. What other shoes have you worn and liked in the past? The nike lunarglide 5 and the flyknit lunar . And what did you like/did not like about them? I liked the lightweight, the design and the comfortability( this one specially in the flyknit lunar 2). You could stick to the Flyknit Lunar 3, then. It is an improvement over the Flyknit Lunar 2 in a few ways. I´ll definitely keep your advice in mind. Thanks a lot for your time.